For the 4th time, ICC Netherlands takes the initiative to organize ICC’s International Integrity & Anti-corruption Conference, the yearly multi-stakeholder conference fosters an open dialogue between executives and experts from private and the public sector, NGOs and academics and galvanises a response to current matters, raise awareness and promote ethical behaviour. The event fosters an open dialogue on existing barriers faced by anti-corruption practitioners in their daily work, and their impact on achieving actual results in the fight against corruption. The event is also an occasion for leaders to restate their commitments in fighting the phenomenon of corruption both at national and international levels. This year’s conference will focus on: “From Ethical Leadership towards Business Ethics”. Underlying all leadership characteristics is the need for a strong sense of ethics – right and wrong – to help those in the organization that look for moral guidance when difficult issues arise or workplace conflicts occur. Leadership and management go hand in hand. They are not the same thing. Which part play leadership, culture, values, rules and enforcement when it comes to business integrity? You can now pre-register for the conference on Friday 6 December 2019 by clicking on the button below. We look forward to welcoming you to the fourth edition of ICC’s Integrity Conference. The expected participation fee for the conference will be EUR 95,- excl. 21% VAT. For the 4th edition of ICC’s International Integrity and Anti-corruption Conference, ICC Netherlands looks forward to hearing your ideas! Just like the previous years, there will be a range of interactive workshops in the afternoon that you can choose from. If you have great ideas or suggestions regarding workshop subjects, or interesting speakers related to integrity and anti-corruption and the overall theme of the conference: “From Ethical Leadership towards Business Ethics”, you can send us an email. Please do not hesitate to contact us if you would like to host an innovative and interacting workshop yourself. You can send an email with your ideas and suggestions to Ms. Marijke Wolfs via wolfs@icc.nl. 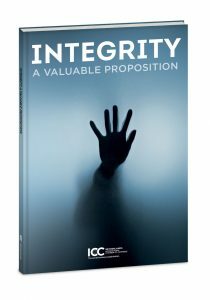 For the occasion of ICC’s International Integrity & Anti-Corruption Conference 2018, ICC Netherlands launched the book ‘Integrity, A Valuable Proposition’. This booklet aims to promote further thinking and invites you to assess your role in paying integrity forward, wherever you go. The Dutch minister Sigrid Kaag, minister for Foreign Trade and Development Cooperation, received the first copy of the book, highlighting the importance of integrity among politicians and in the public sector overall. For more information on the booklet, and to freely download it, click the button below. If there is anything you would like to know about ICC’s International Integrity & Anti-Corruption Conference, you will probably find the answer on our frequently asked questions page. You can access this page if you click the button below. If the FAQs do not answer your question or if you need additional support, please contact us by sending an email to conference@icc.nl. For an impression of the conference, please watch the 3-minute video below. To learn more about the importance of integrity, please watch the 3-minute video below.